Picked this recipe off of A Beautiful Mess' website. Although I'm no stranger to this dish (I kinda order this each and every time at Yellowcab), I've always fancied making a somewhat slightly ~healthier~ version (aka sans the bacon) of this at home. Those ones at Yellowcab are just too greasy (but ugh so good) that you wish you could eat it every day but you know you can't. So here's a more basic version because God knows what disaster I might end up with if I try to prettify this recipe or put my own twist to it. (Who am I kidding? I don't even have a twist.) Also, if you've seen my past recipes here, you'd know that I make do with what we have available in our kitchen. So really, nothing so fancy. Firstly, after washing the potatoes (I used 3), I popped them inside the microwave to bake them for about 8 minutes (really depends on how small/large the potatoes you use). You could test if it's soft by piercing it with a fork or a knife. If done, let it cool for a few minutes. Cut the potatoes in half, lengthwise, and scoop out the center, forming a sort of... well. Be careful as you may scoop through the skin and break the potato in half. Transfer the scooped potato flesh into a bowl, add some butter, milk, cheese, chives and salt and pepper and mash it all together. Crack an egg and separate the yolk from the whites. 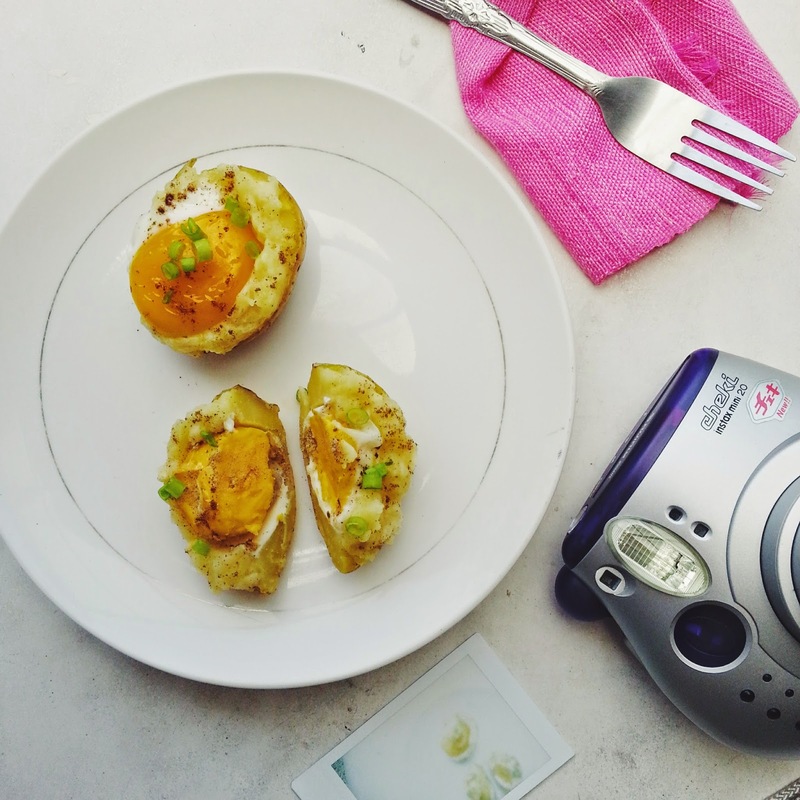 Fill the hollowed potato with the mashed mixture but leave some room for the egg yolk. 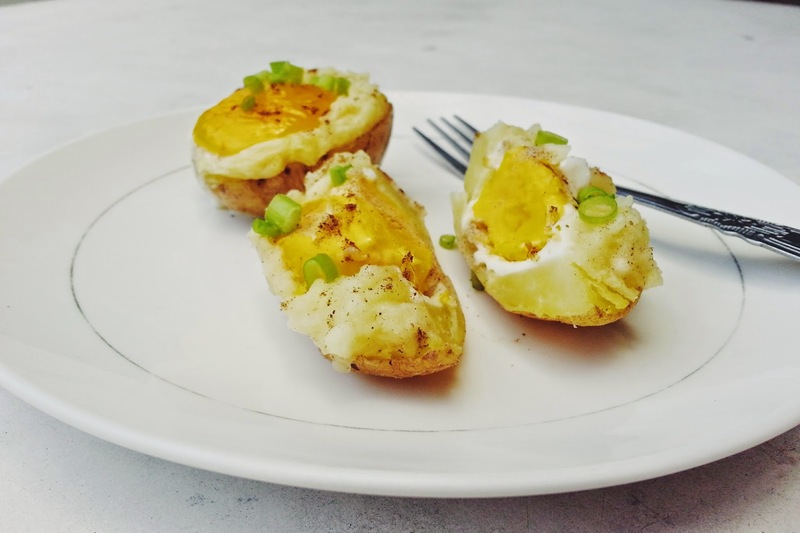 I used very little of the mashed potato mixture since my baked potatoes are so small and the yolks were quite big. Top with more cheese, salt, pepper and chives and put it back in the microwave. Bake until desired consistency of the egg and when the cheese melted. A lighter yellow would mean that it's a more cooked egg yolk.